Walking through the hallways of the College, Somali immigrant and Twin Cities transplant Nur Mood saw few people who looked like him. He felt unsure about how to express his Muslim identity. He wondered whether he'd find acceptance. It didn't take him long to find out. "When I got to know the campus community and I saw that people are very caring, loving people, that's when I felt comfortable," said Mood, who graduated in 2012. "Hospitality is not just a word, but it comes from the heart from everyone." His personal history contains difficulties. War broke out in his native Somalia in 1990, just before he was to start first grade. He lost members of his family. He prayed for peace. He wished for simple things like a good night's sleep and one normal day to be able to play outside without fear. His life changed when he and his family became refugees in Egypt, and eventually applied to come to the United States. "We finally got the opportunity in November 2004," Mood said. "We decided to move to Minnesota because it's a state of immigrants." Settled into a new life in the Twin Cities, he made the difficult choice to uproot himself again - this time for his education. The risk was worth it. "Going to St. Scholastica was one of the greatest decisions I've made for my life so far," Mood said. He took advantage of everything St. Scholastica had to offer. 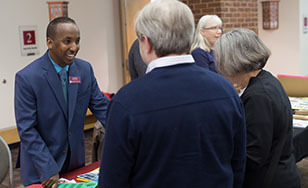 He served on the Student Senate, worked in the admissions and Student Activities offices, gave campus tours, and jumped at the chance to speak to classes about his Muslim faith. He even studied abroad in China. Since he moved back to the Twin Cities for a job at Hamline University, he has never completely left St. Scholastica. "Being a Saint...that was powerful for me. You're a Saint forever," he said. "No matter what, when you graduate from St. Scholastica, there's still someone thinking of you." He formed close bonds with many of the faculty and staff members who had a meaningful impact on his life. He still keeps in touch with them, including Elyse Carter-Vosen, associate professor of Global, Cultural and Language Studies. "She connected me to her family, her synagogue," Mood said. He helps out with a "Migration, Diaspora, Identity" course that she teaches. It focuses on the Somali and Hmong experience in the Twin Cities, and Mood takes time out of his busy schedule to take the students on a daylong tour of Somali and Muslim culture. "Our visits to the Somali community were made possible through his expertise, relationships, and generosity," Carter-Vosen said. "As my students can attest, it seems like he knows nearly everyone in the Somali community in Minneapolis. He's always got a smile for everyone. He's a radiant person who draws other people to him." Mood is also an active member of the Alumni Board, and hasn't missed a commencement ceremony since he graduated himself. As coordinator of Religious & Spiritual Life Programs at the Wesley Center at Hamline University, he was awarded the Hedgeman Outstanding Staff of the Year Award. He's also working on an MBA in finance. With the intent of strengthening Muslim/community relations, he serves on the Bloomington Police Department Multicultural Advisory Committee. "We are trying to educate people and make sure they know that before you attack anyone because of their faith or race or anything, you should get to know them. Don't believe what the media says all the time."